A map suitable for printing on one page, with coordinates and profile can be had by clicking on the map. Note the difference in mileage between TOPO! and the GPS. At this point I don't know which one to believe. The waypoint file for this hike is salmon.wpt. Right click on the link and save the file. Now the description. For this hike, we kidnapped Madalyn (a.k.a. Madie). We left our house at 8:33 am and hiked on the Ruby Ranch Spur to the Mesa-Cortina. For those of you reading this not living on or visiting as guests at the Ranch, you will have to find other access to the Mesa-Cortina. The Mesa-Cortina from this point to its end at the South Willow Brook is an old jeep road from the ranch. There is very little elevation gain for this portion of the hike. The trail is well traveled, with access points from the South at the Mesa-Cortina trailhead, Ruby Ranch, and the Willowbrook development. Traveling to the South Fork, you may encounter muddy spots, especially at the following locations: 1) right after the Ruby Ranch Spur meets the Mesa-Cortina (this is also where the Willow Brook trail comes in) and 2) just before the South Fork of Willow Brook. The bridge crossing the brook is a three log bridge, which our dogs negotiate without difficulty. 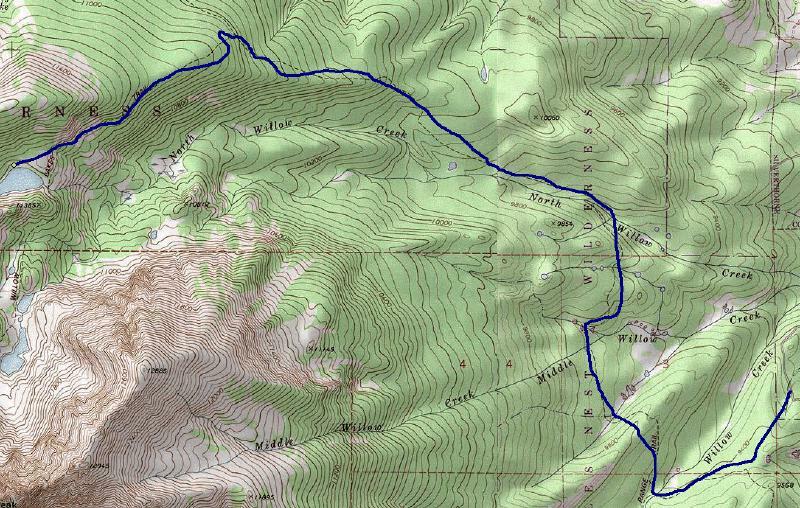 Immediately after the bridge, the Mesa-Cortina trail ends and becomes the Gore Range Trail. A sign will mark this, with a narrow trail coming in on your right. The Gore continues on straight between Buffalo and Red mountains, but that is another hike (or maybe several other hikes). Take the right branch, which will immediately start a steep climb up to the ridge which divides South Willow Brook from Middle Willow Brook. Descending down from the ridge, you arrive at a meadow, which we have found both dry and wet depending on unknown conditions. Leaving the meadow, you are back in the forest, and after a short hike come upon small streams. You have to use the rocks to cross these. Finally the Middle Fork arrives with what I call the Missing Third Bridge. The approach to this is a dirt bridge through some wetlands, stopping at the brook, then continuing on on the other side. You have to step on a rock which barely (or almost) clears the surface of the water. The brook itself has been dammed up by beaver, so the water is not running very fast, but it might cover the rock. We saw trout in the pond. After negotiating the Missing Third Bridge, you climb to another ridge which will divide the Middle Fork from the North Fork. Descending down to the North Fork, you come to a 2 log bridge. After crossing this water, the trail takes a hard left to start the climb. On your right is another access trail, from Eagles Nest (I think) which is marked by paint blazes on the trees. When you return to this point, you need to keep an eye out for the back side of the trail sign, which is presently sitting on the ground by a tree or you will miss the turn. Upon turning left the trail parallels the creek for some distance. The hike will go in and out of meadows and forest. Eventually the trail begins the climb. You may come across a small stream, which we believe is an irrigation ditch. During our first hike up this trail on the way up, there was no water, but a couple of hours later when we came back down, it was running with water. After the ditch, the climb continues bearing somewhat to the right (North). 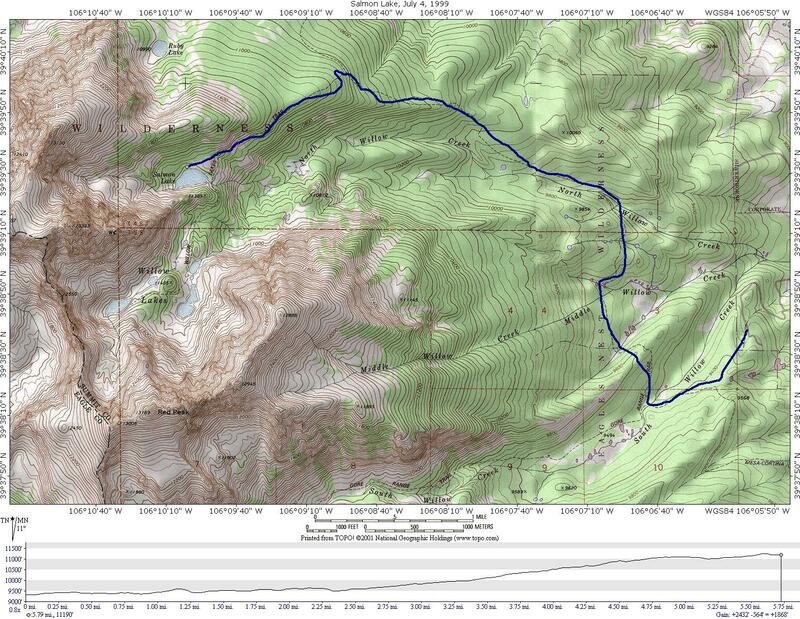 The next landmark will be the junction of the Gore Range Trail with the Salmon Willow trail. This trail will come in on your left. Hiking on the Salmon-Willow, after a short level stretch, the trail will turn slightly Northward, and start what we consider the steepest part of the climb. A switch back will be reached, and then the trail will start to level out. At this point most of the elevation has been attained. There are some campsites here, but no water. As the trail continues towards the lakes, the slope of the hill becomes steep, but the trail remains level. The next landmark is the split in the trail. The Salmon Lake trail goes off on your right, while the Willow Lakes trail continue on straight. Do not be fooled by an earlier trail which is not on our maps but which we think goes to Ruby Lake (future target of exploration). The actual trail junction has a nice Forest Service sign. Continuing on towards Salmon Lake, the trail starts to climb. Neat rock formations are on your right. After crossing a ridge, the trail descends to Salmon Lake. The lake will be able to be seen through the trees on your left. The trail disappears in a wetlands area, but the lake is plainly visible ahead so you get to make your own trail for the last bit. You may see campers in this area (we saw 4 tents altogether). The lake is popular for both fishing and climbing the Thorn.